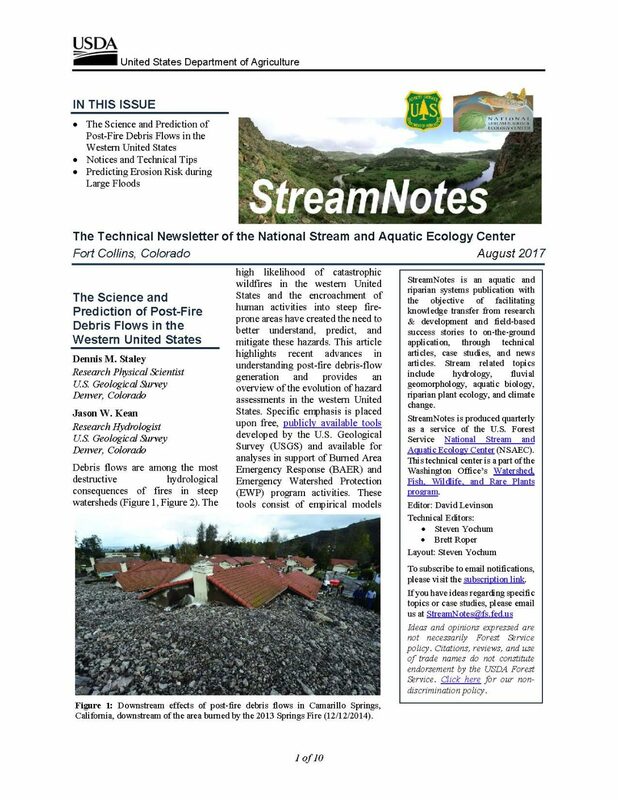 Debris flows are among the most destructive hydrological consequences of fires in steep watersheds. The high likelihood of catastrophic wildfires in the western United States and the encroachment of human activities into steep fire-prone areas have created the need to better understand, predict, and mitigate these hazards. 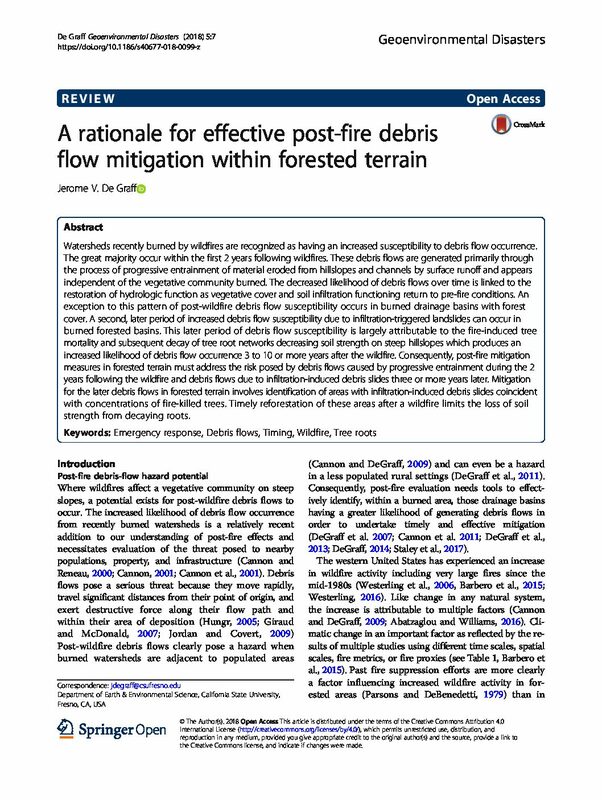 This article highlights recent advances in understanding post-fire debris-flow generation and provides an overview of the evolution of hazard assessments in the western United States. 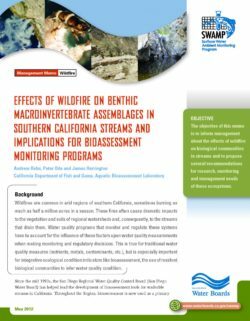 Specific emphasis is placed upon free, publicly available toolsdeveloped by the U.S. Geological Survey (USGS) and available for analyses in support of Burned Area Emergency Response (BAER) and Emergency Watershed Protection (EWP) program activities. These tools consist of empirical models that predict the likelihood, potential volume, and the rainfall intensity-duration thresholds for debris flows in recently burned watersheds. The relationship between drought and wildfire can appear to be simple, but the drought and wildfire nexus encompasses a profusion of human and environmental impacts. Images of burning forests, neighborhoods, and “smoked out” communities are all now commonplace. Applications team), the Desert Research Institute (DRI), and the National Drought Mitigation Center (NDMC), hosted the Integrating Drought Science and Information into Wildfire Management Workshop in Boise, Idaho on 21-22 October 2015. The 22 participants in the workshop were invited as representatives of a broad spectrum of expertise including prescribed fire, wildland fire management, climatology, smoke and air quality, fuels management, fire behavior, drought, and policy. 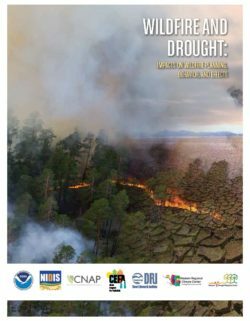 In this report, we present the opportunities and challenges the workshop participants identified and the impacts of drought on wildfire. The workshop also provided the opportunity to identify next steps in understanding and addressing drought impacts on wildfire.